I had a door that was slamming harder than I would like so I decided to look into how to stop it from closing so fast. After doing some research, I found that most door closers have a few ways to adjust them including a Swing (How fast the main swing is), and a Latch (how fast it closes at the end). Some also have a way to adjust the Back Swing. Basically you turn the screw to the right to slow it down, and turn it to the left to let it close faster. 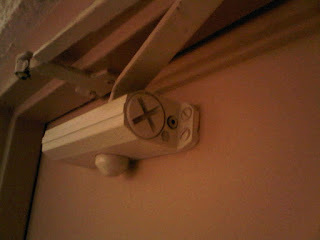 I saw that my door closer said Norton on the bottom so I knew that was the brand. I looked it up but couldn't find the exact model, probably because it is old and out of production. Anyway, on the right side there was one place that looked like you could adjust it. You can see in the picture, it is the hole to the right of the big X. I used a small hexagon wrench, about 1/8th inch and turned it clockwise just a little bit to see if it would do anything. To my surprise, it worked perfectly! Just the little turn slowed down the latch speed so it closes much more softly. So if you have a door that is slamming and it has a door closer, just look for the little wrench holes or screws and turn them a little to the right and it should help slow it down. Another tip to lessen the noise is to get a little rubber adhesive stopper/bumper and put it on the door jamb inside where the door closes against it. This should help prevent the door from hitting directly against the frame. If this guide was helpful, or you have any questions or tips, leave a comment below. Thank you, This was exactly the information I needed. Worked like a charm. Does anyone know the model number, I have one just like this.